Vanilla Greek Stonyfield Organic, with oat, a spoon full of pumpkin, half a banana and some almonds. Time for a little sunny stroll, have a good day! The man-friend has a serious case of the "man-cold," so what better cure than some homemade minestrone! My first actually. Saute the onions, garlic, carrots until softened. Add the diced sage and broth. Mix in all the veggies, beans and diced tomatoes. Salt and pepper to taste. Let simmer until ready. Sick of veggie burger posts yet? I'm not! Black bean Morning Star burger. My first! Loved it! I had veg and the others had turkey burgers. Check out my cool new pine cone center piece! Green salad on the side. Hope everyone had a good weekend! 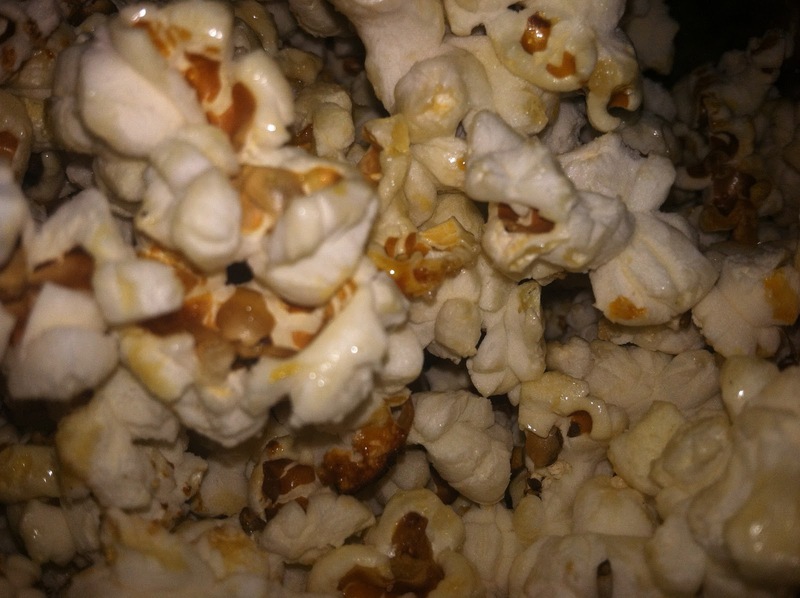 Homemade Kettle corn! 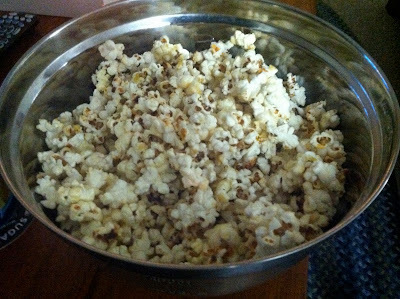 I discovered a super easy recipe online. 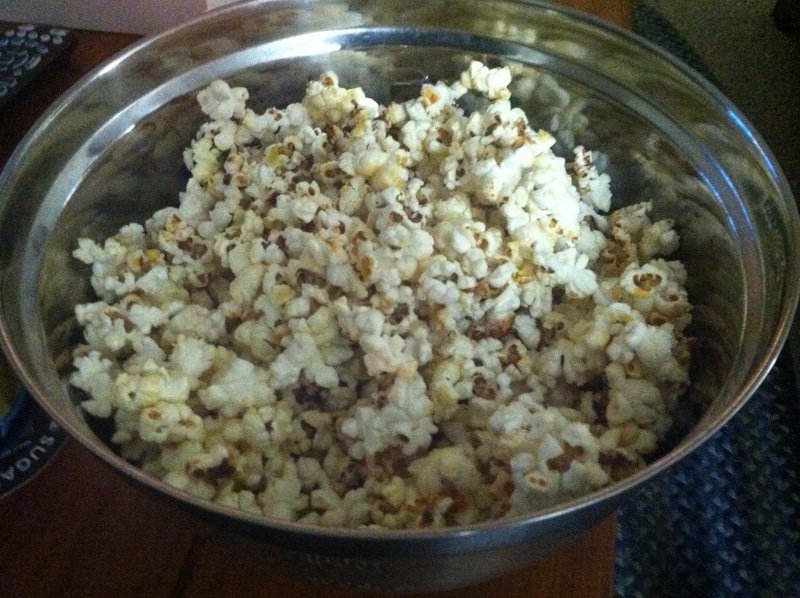 In a big sauce pan with a lid mix 1/2 cup pop corn, 1/4 cup canola oil, and 1/4 cup sugar. Heat pan on med/high heat. Cover and shake frequently. When popping slows uncover slowly and salt to taste. We decided not to grocery shop this week because of Thanksgiving and the Man-friend would be away for a few days. Even though we had very few fresh ingredients in the house I always have lots in the freezer! Quick Naan pizza to the rescue! Frozen Naan, frozen broccoli, the last of the feta, some onion and the last of the shredded cheese. A little garlic and olive oil as the sauce. Ten minutes in the toaster oven and lunch is ready! Some apps. A spicy red pepper spread. I made stuffed mushrooms from KERF (Kath Eats Real Food) I made the Lemon, almond, honey and sage variety. 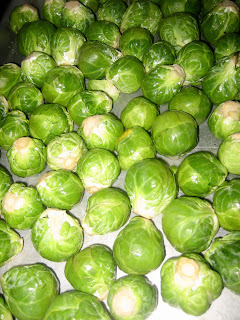 They were tangy and delish! 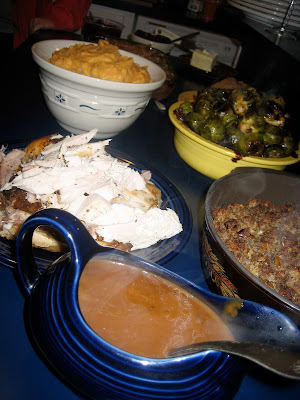 I make this stuffing every year. Apples, cranberries, celery and onions. Vegetarian deliciousness :) This one of the three different stuffing varieties on the table! What's thanksgiving without pies??? We had way too many. Hope everyone had a great holiday! This is a small lunch sized salad and nothing like the enormous dinner sized creations! I've said before that I'm picky about dressings and usually make my own. But, I do really love this strawberry balsamic! It's so sweet and light. 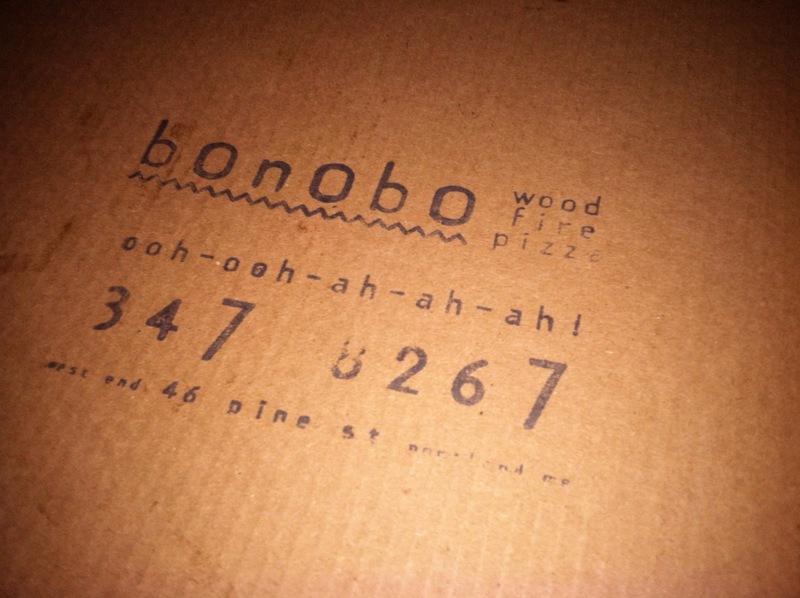 Last night we ordered pizza for dinner from Bonobo, one of my favorite pizza places. It's right in the West End, very close by. We each got a house salad which I LOVE! It's made with romaine, spinach, endive and pickled cukes mmmm yummmm. Mellow evening in for me watching Gossip Girl and fantasizing about more pizza! I've had a acorn squash hangin' in my fruit bowl for a few weeks and I've got to eat it before it goes bad! Never, ever, ever, ever let fresh produce go bad! I was in the mood for soup so I decided to make it into a bisque. Acorn squash and apple bisque is on the menu! Bake upside down in 1 inch of water, covered with tin foil at 375*F. In a sauce pan add about a tablespoon of Olive oil and saute the garlic. Add the vegetable stock. After about 45 minutes (or until a fork easily punctures the squash's skin) spoon out the squash and add it to the sauce pan. Stir in brown sugar (probably 3 tablespoons), a couple dashes of Cinnamon and salt and pepper. Peel and dice an apple and add that too. I let this simmer for a while and stir occasionally. I pureed mine in the blender to make it smoother, but that's optional. Yummy! I also made some sweet and salty croutons out of cranberry bread that was in my freezer. I'm working my way through a ginormous container of spinach if you've noticed its presence in the last few posts. 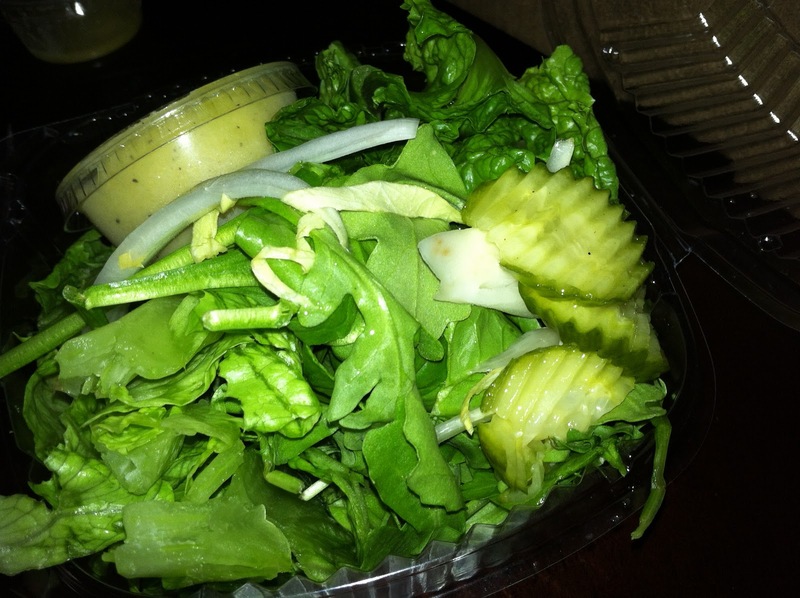 I go through phases with greens, arugula, spinach, lettuce heads, mixed greens. I've never met a green I didn't like. Spinach, cukes, avocado, shredded cheese, salsa, light sour cream and sriracha.